Mercedes-Benz' Self-Driving Car Completes First Autonomous Cross Country Trip! Mercedes-Benz’ Self-Driving Car Completes First Autonomous Cross Country Trip! Mercedes-Benz just announced that it completed the first autonomous cross country and inner city trip in its self-driving S 500 Intelligent Drive research vehicle! The vehicle was able to drive from Mannheim to Pforzheim, Germany without any intervention from a driver thanks to its near-production-standard sensor systems. Mercedes-Benz has promised to provide the full details of the cross-country trip tonight on the eve of the 2013 Frankfurt Motor Show. 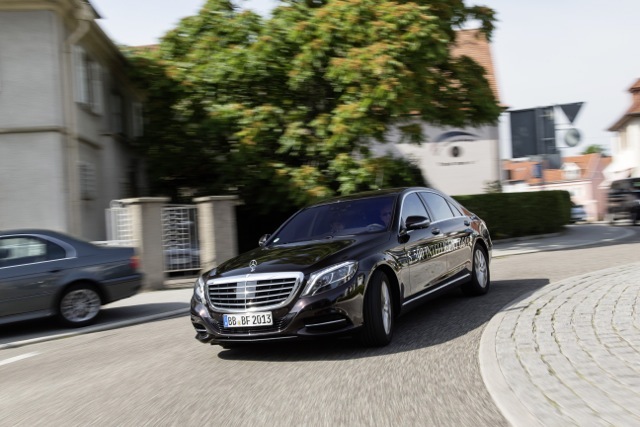 Prior to the trip, self-driving cars have either been tested on closed roads or using complex technologies, but the S 500 Intelligent Drive uses near-production-standard technologies, very similar to those already available in the new E and S-Class, to drive itself. Self-driving cars are expected to arrive soon, but Mercedes-Benz doesn’t see them as an attempt to ban the driver. Instead, the automaker sees them first and foremost as the next logical step to accident-free driving. Hi Kelly, can you contact the editors at [email protected] with the image in question? I am developing a TED Talk for an event at Virginia Tech (TEDxVirginiaTech) where I will be discussing the future of connected vehicle technology and eventual self-driving vehicles. I was wondering if I could obtain your written permission to use one of your photographs in my presentation. I am particularly interested in the photograph that shows the "driver" of the car without his hands on the steering wheel. Please feel free to contact me if you would like any additional information regarding my talk.